Do you have a set of reports that you access frequently? Are only a few (or none) of them available on app or table Home pages? Then Favorites are for you. When you display a report, the Favorite command is available from the Page bar so you can add favorite reports to the list. These favorites are yours, and they are app-specific. Other users will have a different list of favorites, and your list of favorites will be different for each app. Click Favorite on the Page bar. Reports marked as favorites appear in the Favorites dropdown on the Global bar. The new favorite appears at the top of the list of favorite reports. Click Favorites in the Global bar. Display recently-visited reports by clicking Recently visited in this app in the Favorites menu. Click the star outline next to a recently-visited report. Note: Reports that display a yellow star to their left are already favorite reports. 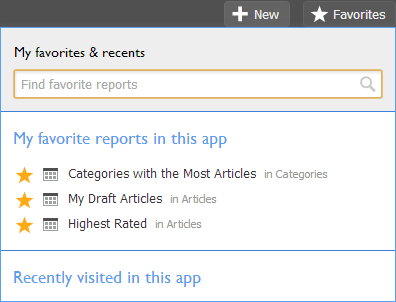 You can mark up to 50 reports as favorites. If you have 50 favorite reports, you will need to remove a report from the list of favorites before adding a new favorite report. I'm looking at a report, and I don't see the Favorite command. Why not? If you've searched for data in a table, the results of that search aren't treated as a report until you save them, so the Favorite command won't appear. If you have modified the report and not saved it, the Favorite command is disabled. Reports shown on table Home pages do not cause the Favorite command to appear. Multiple reports are often shown on app Home pages; display the individual report using the Full Report link to favorite it. Click Favorites on the Global bar. Find the report in the list of My favorite reports in this app and click it to open it in the current window. Every time you add a favorite report, it is added to the top of the list on the Favorites dropdown. Since you can add up to 50 favorite reports, you may want to rearrange the list to put the reports you use most often nearer the top. You can rearrange the list of favorites by dragging and dropping in the list. Find the report, and deselect the star to its left. The report remains on the list until you close the Favorites dropdown (in case you deselected the wrong report by mistake).